So when we last left our restoration project, things were looking much cleaner. So now I need to make a decision. Do I just put the plane back together and put it back to work or do I take it a step further and make it pretty again? In most cases, I wouldn’t bother with anything more than grinding and sharpening at this point. However, in this case, I find myself in a bit of a pickle. If you’re a purist, I suggest you stop reading now because you’re probably not going to like what I do next. But this plane isn’t in any way rare or collectible, sooooooo……….. While the japanning on the main plane body isn’t in terrible shape, the frog is embarrassingly naked. The rust remover did a great job of removing the rust on all the parts that spent the night soaking. It revealed that a good amount of the Japanning on the main plane body still remained, although most of it was quite oxidized and dull. What I didn’t expect is that the overnight soak would cause all of the red paint on the frog to soften and peel. Hence, my frog is naked. The finish on the tote and knob, or what’s left of it, has also seen better days. An inspection of the tote and knob reveals a similar state of affairs. What little finish is left on them is dull, cracked, flaking off, and just plain ugly. So while they are completely functional, they are also in need of a bit of a facelift. So I started by preparing the plane body and frog. No, I’m not painting them green. Since the frog was naked, I really had no choice but to paint it unless I wanted the entire thing to rust. And while the plane body really didn’t need to be painted, I felt that if I painted the frog, the dull and only partially japanned plane body wouldn’t quite fit in. So if I was going to paint them, I needed to mask the areas that I didn’t want painted first. The frog took a bit of patience, and I didn’t want to remove the riveted on lateral adjuster, to that had to be masked in place. Masking the body wan’t so bad, except for the area down inside the throat where the frog bears. So rather than masking this area, I coated the spots I didn’t want painted with petroleum jelly. Then it was outside while the weather was nice to paint. I’m not that picky about paints for old hand tools. Most of todays spray paints will work, and I typically will use whatever rattle can paint I can find that I think will look OK. Spray paints are not as hard or durable as the old Japanning, but if allowed to fully cure in a warm place for about a week after painting, they’re plenty durable enough. I’m not trying to be historically accurate here. I’m merely protecting the iron from the environment and hoping to stave off rust. Again, the tools that I’m giving this kind of treatment to were made by the thousands, if not tens of thousands and are not in any way rare or valuable. 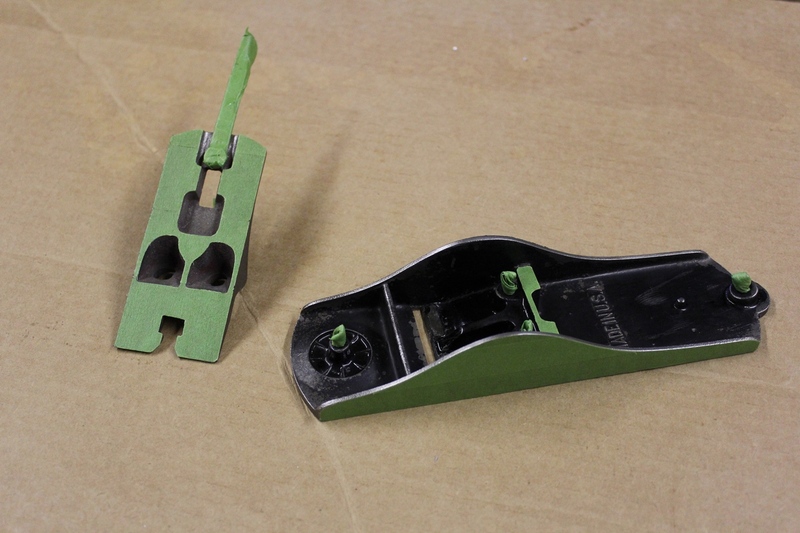 A card scraper removes thick varnish fast. While the paint was drying on the iron bits, I turned my attention to the wooden ones. Over the years, I’ve tried sanding, chemical strippers, but nothing works quite as fast, or as well as scraping. So I spent about 10-15 minutes with a small card scraper and completely stripped the tote and knob. The cracked varnish came off easily and left some not to shabby looking rosewood. Not the nicest I’ve ever seen, but not terrible either. So the scraped tote and knob got sanded with a bit of 220 grit to smooth and even out the texture before three coats of Minwax Antique Oil Finish (i.e. linseed oil & alkyd varnish mixture thinned to a wiping consistency). Once the varnish dried for a couple of days, I rubbed it down with paste wax and 0000 steel wool, then buffed it to a smooth, soft luster. Then it was time for reassembly. Much better than the condition I got it in. The paint I ended up using was a semi gloss black. I’ve found that regular [high] gloss is just too much shine, and flat just doesn’t look right on these older planes. I also decided not to go with the original red for the frog. Maybe it’s just me, but I don’t care for the different color frog look. Now to make it sing. All that’s left now is the final sharpening and tune up. But that’s going to have to wait, as this plane is going to be the demo tool for my sharpening and hand plane tuning seminar in April. Posted in Hand Planes, Tools and tagged Craftsman, painting, restoration, smooth plane. Nice article! I bought an old Craftsman No 7 with Corrugated sole a few years back. Hard to say if it was made by Stanley or Miller Falls to Sears specs. It obviously did not work very well out of the box which led to it’s neglect. I discovered that changing the frog screw washers to a smaller diameter allowed just the right amount of adjustment. Once the frog was repositioned the plane worked fine and I still use it. I like the fact that I was able to make a neglected tool useful again! Thanks Rick! I think a lot of the “off” brands are commonly overlooked. But many of them are just as good as the big names. Hi. Stumbled upon your article here. 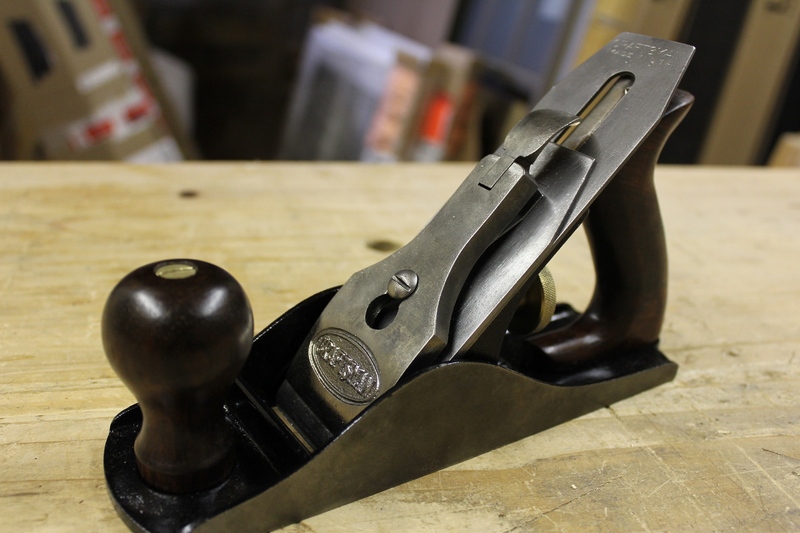 You’re right that these Craftsman planes are, in many cases, overlooked gems…with a couple of caveats. First, Sear’s specs for castings seem to have been significantly relaxed sometime in the late 50s/early 60s. None of these contract-produced planes are comparable in quality to their actual manufacturer counterparts after that time. Sears contracted the production of its planes even prior to creation of the Craftsman brand in 1927. Before that time, Sargent was the supplier and they were sold through Sears under the Fulton brand name. After 1927 (and maybe just before…) there were three major suppliers of planes marketed as Craftsman and sold exclusively through Sears: Sargent, Millers Falls, and yes…Stanley. 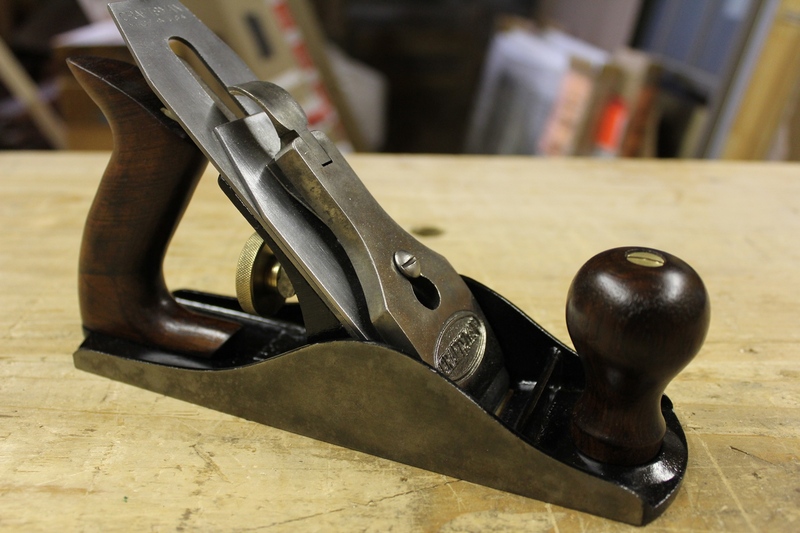 So there is a pretty decent chance that a vintage Craftsman plane that you pick up is in fact a re-badged Stanley plane, manufactured by Stanley, in the Stanley plant, by Stanley craftsmen. 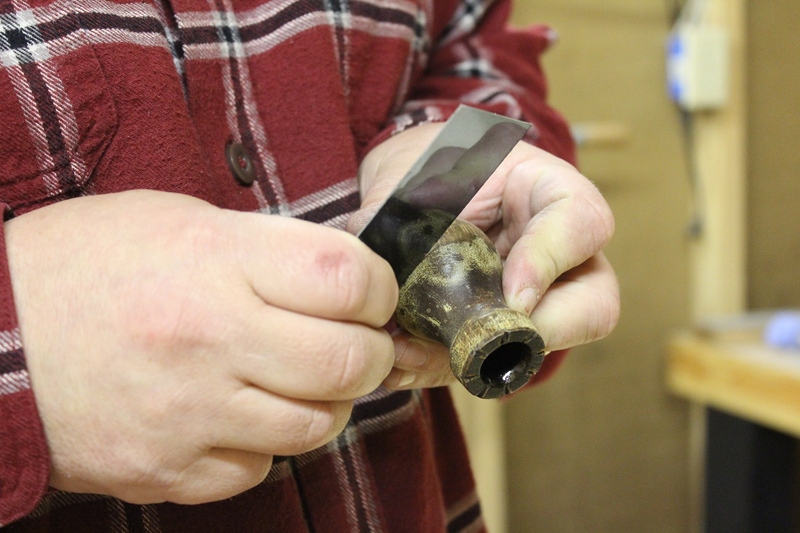 Or it’s a Sargent or Millers Falls plane; all manufacturers of quality hand tools at the time. However, it is worth noting that these planes were made under a lowest-bidder competitive contract context, so they are not generally at the same “cost of manufacture” of their parent-branded counterparts (almost all of them are re-badged versions of tools available on each manufacturer’s then-current product line). 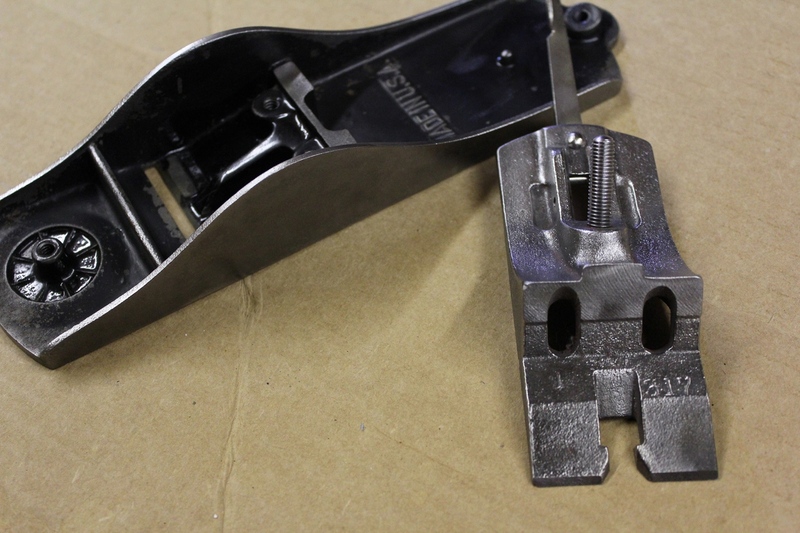 That being said, the corner-cutting had a tendency to show up in aesthetic downgrades, for example replacing brass components with steel, like in the control knob. The one exception is that none of them (that I’m aware of) incorporated frog adjustment, although that might have had more to do with the original patents than cost savings. It seems it would actually be more expensive to re-tool a manufacturing line to remove that capability than would be saved in manufacturing. The other explanation, more likely I think, is that none of these companies were particularly interested in offering a plane to Sears that would undercut sales of their own-badged versions. Make them good enough to win the contract, but not good enough to put yourself out of business. That all said, quality seems to have been high in manufacturing standards, at least equal to the parent company, which makes sense because none of the firms created separate factories to build the tools. So how do you know who made your plane and when? The answer to the first question has to do with model numbers that can very often be found stamped on the sole or iron (while it’s true that irons could easily be replaced, the fact that these don’t have great collector value makes it unlikely that someone would intentionally do that). For an exceptionally well researched reference, visit Don’s blog at timetestedtools: http://www.timetestedtools.net/2016/02/26/craftsman-hand-plane-model-number-comparison/. You can pretty quickly match up your model number to which company manufactured it, and it has linked images for comparison. As far as question 2, when was your plane made? That’s a bit trickier, however tracing the lineage of the Craftsman logo itself can provide some good insight. Your plane, which had a blue background oval logo with the crooked “C” indicates that it was most likely manufactured sometime after WWII (mid to late 1940’s) up to as late as the mid 1950s. 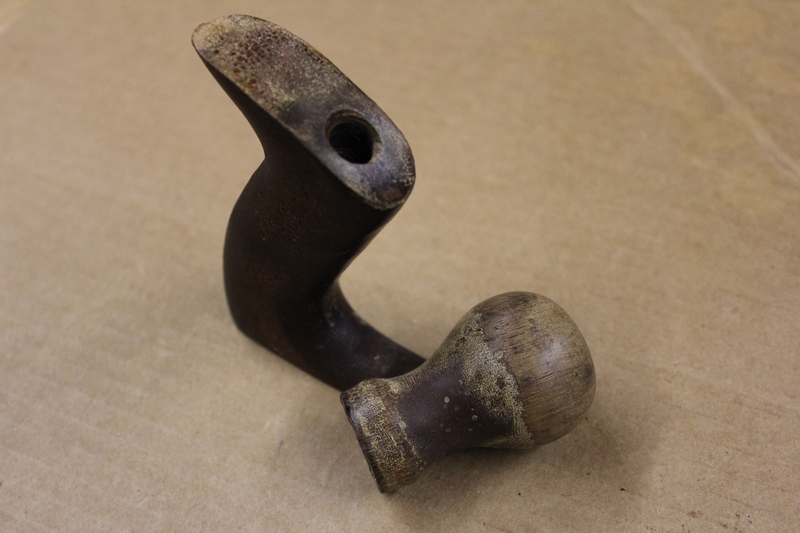 So it’s definitely a post-WWII tool, which means iron and steel weren’t being rationed, so that probably resulted in a stronger casting of the sole and frog, but not up to the standards of pre-WWII manufacturing. So I’d say what you’ve got there is a very solid tool that, after you square it up and tune it can provide another 75 years of faithful productivity. And when you use it in your demo (if you haven’t already), you can reference this post to show that there are literally insane people in the world who spend WAY too much time researching relatively valueless vintage Craftsman planes. Sorry, update to my previous comments. After reviewing the previous blog post (part 1), I realized that your plane didnt have a 40s/50s logo (blue background), but instead it’s a yellow background. Probably looking at 60s or 70s vintage there. I would normally pass on this example if I run into it at a shop or online, mostly because of the diminished quality compared to earlier, heartier examples that are relatively plentiful. I also as partial to the earliest examples, Fulton brand (which were Sargent and Millers Falls) before 1927, and the “wavy” Craftsman in an oval logo, indicating earliest examples of Craftsman brand from 1927 into the early 30s. But that’s just me and isn’t necessarily reflected in market value or collectability. Thanks for the information! I did the tuneup demo back in April. The plane worked flawlessly, every bit as good as any Stanley, Sargent, MF, or any other brand I’ve ever used. It’s currently part of the school’s tool chest and serves our students very well.